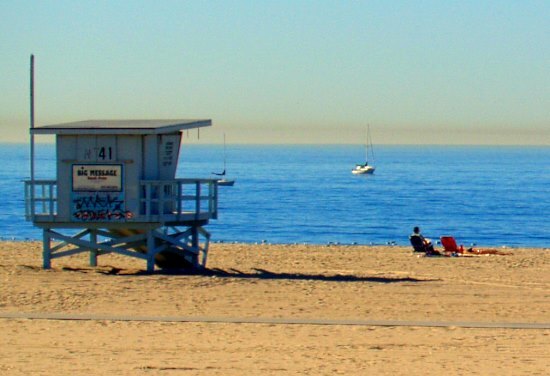 Playa Del Rey is one of the less crowded beaches in Los Angeles county. The airplane traffic from LAX is a little heavy. But, If you want to catch a close up view of a 747, there is one section south of Dockweiler beach where planes take off only several hundred feet over the ground. 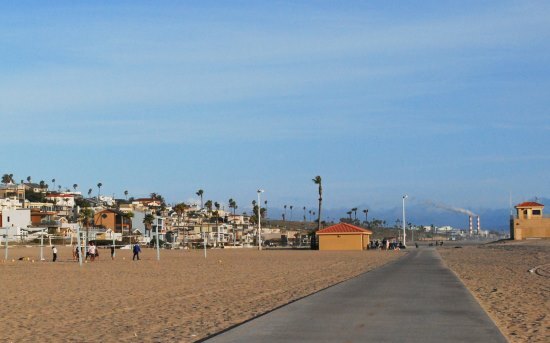 Dockweiler was recently refurbished and is now equiped with volleyball and basketball courts. Because of the lack of crowds, it is ideal for kite flying. Part of the beach allows trailers and campers to park and allows barbeques. Dockweiler is one of the few spots in LA that you can BBQ on the beach. Ballona Creek separates Playa Del Rey from the Marina. The 16 acre tidal wetland is the refuge for marine and mudflat	creatures including the southwest Willow Flycatcher, an endangered species of bird. The topic has been hot for a while as L.A. City Council and real estate developers would like to make some money on this valuable piece of real estate. Environmentalists are vigilant in protecting the wetlands from ever being developed into beachfront homes and have been successful so far.